Majok Guet on-air at Mingkaman 100 FM. Sept. 7, 2015, protesters claiming to be the original inhabitants of Awerial County were demanding jobs. The young men were upset that humanitarian agencies had South Sudanese working for them who come from neighbouring states and counties. They demanded a quota system to guarantee more jobs for locals. Mingkaman is 130 kilometres north of South Sudan’s capital, Juba. The protesters stormed the gate at Mingkaman’s humanitarian hub, where Mingkaman 100 FM is based. The radio station manager, Joseph Ngor Deng, was attacked by the protesters. The protesters forced their way into the Mingkaman 100 FM studio, assaulting both the cleaning lady, Debra Ajoh, and Good Morning Mingkaman host, Achol Kur. Kur, Ajoh and Ngor Deng are now feeling much better. In response to what happened the team at Mingkaman 100 FM knew they had a role to diffuse the conflict. This meant involving all sections of the community to look at what happened, establish the facts and then resolve matters in a peaceful manner. Importantly, they recognized they were not the story and had to remain as independent journalists. They came up with the idea for a program called Mingkaman Together. Throughout town, radios are heard in almost every home and shop. In January 2014, Mingkaman was a small village. Following the outbreak of violence in Jonglei state, 70,000 South Sudanese crossed the White Nile, one of the two main tributaries of the Nile River, into Lakes state. According to protesters, the main reason behind the Sept. 7 attack on Mingkaman’s humanitarian hub and radio station, was because they fear displaced South Sudanese living in Mingkaman are receiving preferential treatment when it came to obtaining work. These are not easy answers to find. Guet hopped on a motorbike and drove from the radio station to Mingkaman town centre. He approached men and women, old and young. What he heard next surprised him. It turns out information from the humanitarian agencies is slim to none these days in Mingkaman. This is a drastic change from 2014, when IDPs settled into the sleepy village turned regional hub. Nuol Gak Ajak listens to Mingkaman 100 FM. 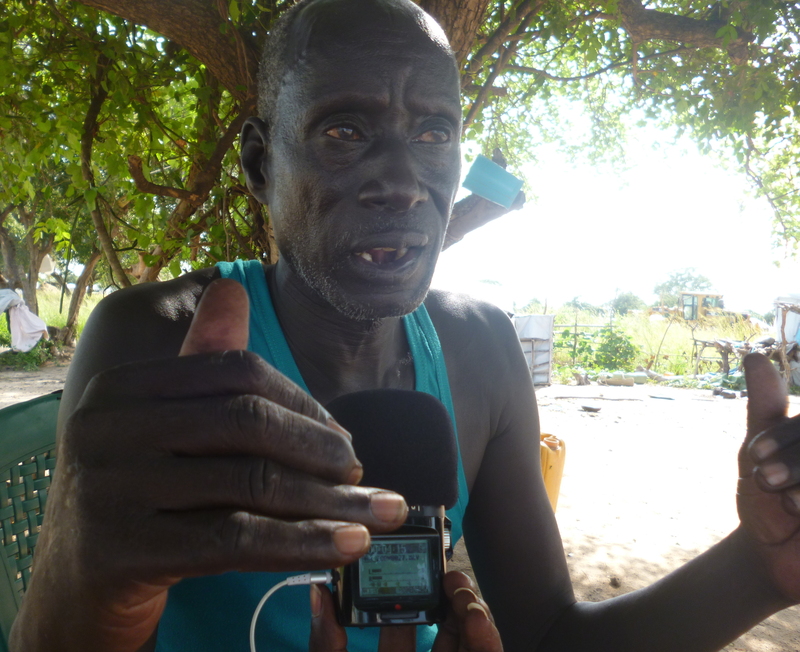 Nuol Gak Ajak, 52, is a father of seven who listens to Mingkaman 100 FM. He told Guet that more radio programs with targeted information from agencies is needed. “This program brought us together. 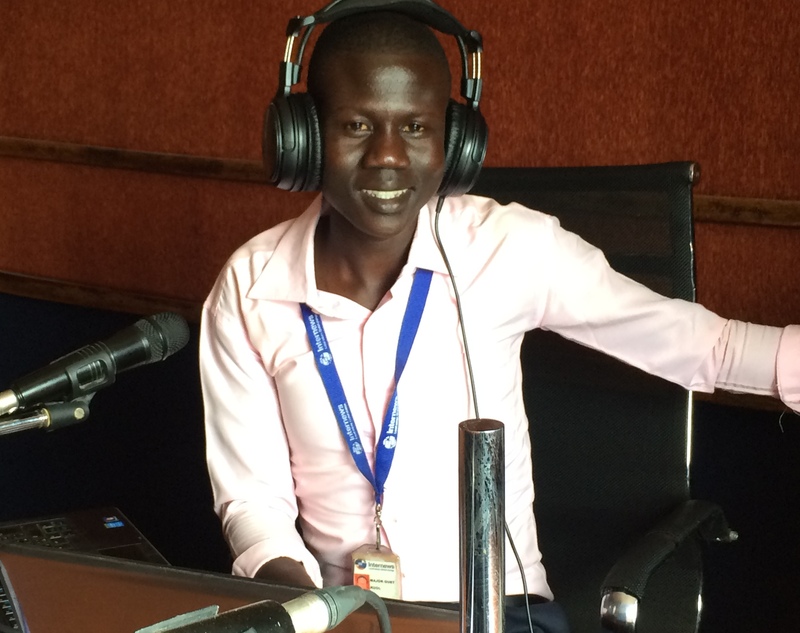 Mingkaman FM is the only source of information we have now,” Ajak said. Rhoda Nyanyeth, 23, is a mother of two. She also listens to Mingkaman 100 FM. *Due to feedback received from the community, Mingkaman Together is now a regular monthly program, creating a conversation between humanitarian agencies and the community, only on Mingkaman 100 FM.